Headed somewhere warm on your next vacation? Being from the Midwest, I always look forward to heading south in the winter for my vitamin D fix. And while I treasure my days in the sun, I also know I need to protect myself and my kids from the sun’s damage. Of course we bring sunscreen with us, but we’ve also added another sun-blocking tool to our beach bag… Coolibar sun-protective clothing. 2015 was the first time the U.S. Surgeon General issued a warning about skin cancer as a major public health threat requiring immediate action, because skin cancer is completely preventable. The Skin Cancer Foundation recommends sun protective clothing as the first line of defense against the sun’s harmful ultraviolet rays. Sun-protective clothing just seems to make good sense. Coolibar garments protect skin in several ways. Some of their clothes and hats are made with titanium dioxide fibers — the same ingredient used in some sunblocks. Their bathing suits, shirts and resort wear boast sun protection factors of 50 plus, blocking 98% of the UVA rays. And in case you’re worried that sun-protection clothes aren’t for the fashion conscious, take a look at these stylish options. I particularly love the tunics and cover-ups, which look chic in the Caribbean, or at the lake. 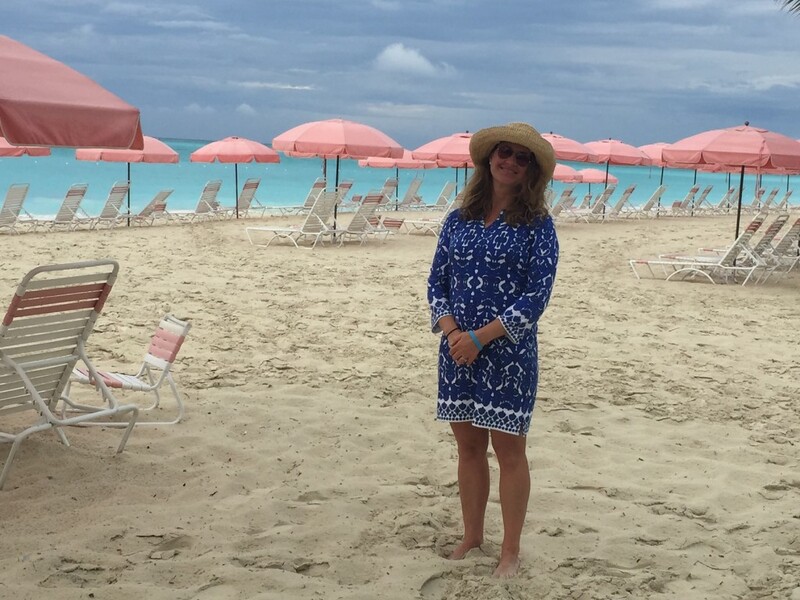 I got to test out my Coolibar wardrobe while enjoying the barefoot luxury of Ocean Club Resort in Turks and Caicos. While it is a laid back environment, and minimal dress code, if any, I’m still a middle-aged mom. I’m not going to be cruising around the hotel in a bikini. I need to be covered up, but covered up with style. So, I pack tunics and cover ups that can be worn throughout the day. These tunics and cover-ups also fulfill another travel wardrobe rule. I’ve been a member of the carry-on club, long before the airlines added luggage fees. Too many hours spent waiting at the airport for my suitcase to show up, or, even worse, the dreaded lost luggage— which can ruin a vacation. So every item in my carry-on has to serve multiple purposes. Coolibar’s tunics and cover-ups do just that. At night, wear the tunic with a pair of white pants to take it from the beach to cocktail hour. They’re the ideal resort wear for this Midwesterner escaping the cold. What’s your warm weather resort must-have? Would you consider giving sun-protective clothing a try?